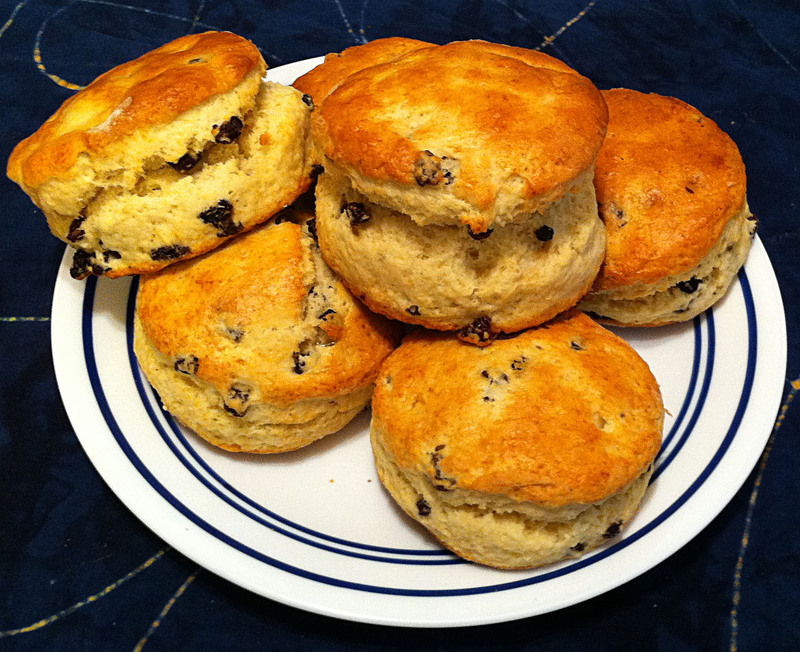 In a recent Cooks Illustrated, they had a recipe for British scones. I woke up thinking about making scones this morning, but Jan had cleaned up and I couldn’t find that issue. Fortunately I remembered enough of the discussion about the differences between American and British scones to wing it. I had actually tied to make these according to the CI recipe a few weeks ago. British scones have a lot less butter, sugar and additions. For British scones, if you add anything it is currents. How you handle the butter also differed greatly. American scones are usually made in the French way, with cold butter that you roll into flakes. Here the point is to prevent the flour from binding with the butter. While cooking the flour forms gluten sheets which the steam from the butter puffs up like balloons. The final product has a flakey, biscuit-like crumb. For British scones, you use warm butter that you work into the flour with your hands. The point is to get as much of the flour to bind with the butter as possible. This actually prevents much of the flour from creating gluten. The remaining un-bound flour forms a more open gluten structure that has a cake-like crumb. I am afraid I was not happy with the results of using the CI recipe. I ran into several problems. Their recipe used a lot of baking powder. I found that using that much tasted soapy. Although I followed their recipe to the letter, they also came out very biscuit-like, not scone-like. Another problem I had was in using the right tools for the job. I have always used a jar lid as a biscuit cutter. For most tasks this is not a distinction that matters, but for soft scone dough the difference really stood out. The rolled edge of the lid pinches the dough apart, rather than cutting through the rolled out dough. Of course, the corollary of this is: If the distinction does make a difference, it does matter. The scones that had been pinched-out baked very strangely. The edges did not expand while cooking and stayed near the bottom of the tray, while the center ballooned into a dome. They ended up looking more like an igloo, rather than a scone. In a good scone, the top and edges rise together to give the final product a cylindrical shape. By cutting the scone out, the dough is not pinched together and is free to rise with little resistance. It took me several weeks to find them, but I finally found a set of biscuit cutters. 1. Sift the flour, sugar baking powder and salt several times into a large bowl. 2. Soften the butter and work it into the flour mixture completely by rubbing it through your fingers. The flour should look a bit “sandy” when you are done. Tip: Ten seconds in a microwave on defrost will soften the butter enough. You do not want to add melted butter, but it should be soft enough to spread easily. 3. Stir the currants into the flour mixture. 4. Add the milk to a measuring cup and beat the egg into it. 5. Add most of the milk mixture to the dry ingredients and stir to combine. Tip: If necessary, add a bit more milk to the mix make a soft dough. 6. Turn the dough onto a lightly floured surface and knead ten times. Note: For most quick breads you are trying to prevent the creation of gluten, which makes for tough biscuits. For British scones, so much of the flour is prevented from forming gluten by the butter that the remaining flour needs a bit of help to form enough to give the scone some shape. 7. Roll the dough one inch thick and cut out the scones with a 2½ inch biscuit cutter. 8. Brush the tops with the remaining egg/milk mixture. 9. Bake at 425° for 12 minutes or until golden brown. 10. Serve warm from the oven. Mmm these look delicious and a great colour!